Are there different types of NAR? NAR has several subtypes. The most common is vasomotor rhinitis, which was the first form identified and has been reported to comprise >70% of NAR cases.5 Vasomotor rhinitis is thought to occur secondary to disturbed regulation of the parasympathetic and sympathetic systems, resulting in vasodilation and edema of the nasal vasculature (Table 1).6-8 Less common forms of NAR include infectious rhinitis, occupational rhinitis, hormonal rhinitis, drug-induced rhinitis, gustatory rhinitis, and NAR with eosinophilia syndrome. What are the symptoms of NAR? NAR causes symptoms similar to AR, regardless of NAR subtype, most commonly including postnasal drip, nasal congestion, runny nose, and sneezing.6,9 Patients with infectious NAR might also experience persistent facial pain or pressure, dysosmia, and cough. Patients with NAR typically do not have itchiness of the nose, eyes, or throat, which are hallmarks of AR.6,9 NAR symptoms can be intermittent, but they are usually chronic and present year-round. Symptoms are often initiated or exacerbated by a variety of triggers. What triggers have been associated with NAR? Many nonallergic triggers have been associated with NAR. These include weather changes (temperature and humidity); consumption of alcohol or hot or spicy foods; exposure to environmental or occupational irritants, such as tobacco smoke, strong odors (eg, perfumes), potent fumes (eg, car exhaust), and dust or smog; use of certain medications (Table 2); and hormonal changes.10,11 Patients with NAR are not bothered by allergic triggers, such as pollen or animal dander, unless they have mixed AR.11 However, regardless of the trigger, all patients with NAR experience swollen nasal membranes. 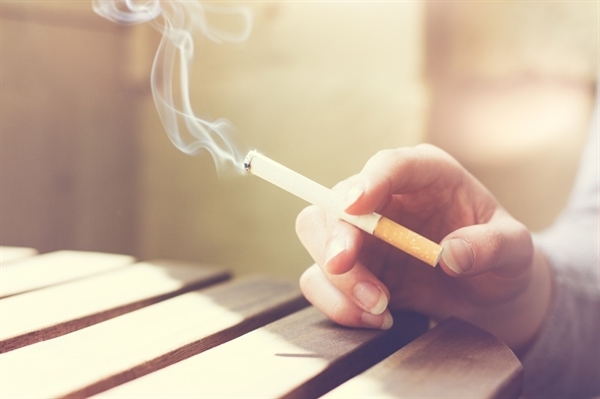 What risk factors have been associated with NAR? 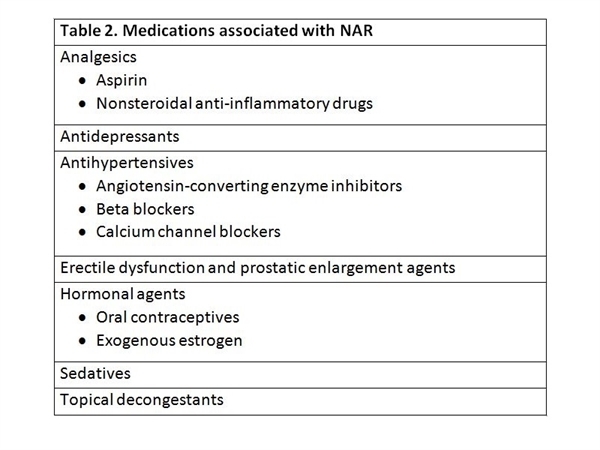 What complications are associated with NAR? 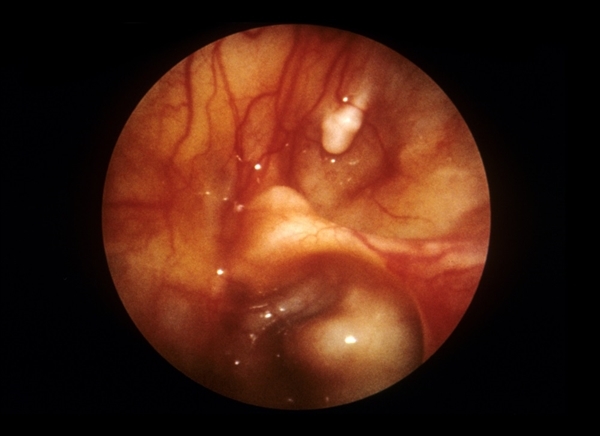 Prolonged inflammation from NAR can cause a variety of other conditions, most notably nasal polyps, sinusitis, and middle ear infections, which are associated with their own complications and challenges.10 Large or multiple nasal polyps can impede breathing and impair sense of smell, whereas sinusitis can increase the risk of secondary bacterial infections, requiring use of antibiotics. Middle ear infections can impair hearing and balance and even result in rare but life-threatening complications, such as cerebrospinal fluid leak.6 A small observational study found NAR to be associated with an increased risk of obstructive sleep apnea syndrome (OSAS), which has previously been associated with AR.12 The study suggests that NAR poses a greater risk of OSAS than AR. This finding was based on polysomnography results and Epworth Sleepiness Scale scores. In general, study patients with NAR were found to have significantly shorter sleep durations and worse sleep efficiency than their AR counterparts. NAR is considered a diagnosis of exclusion. Careful review of a patient’s medical and social history can help point to the diagnosis by enabling irritant triggers and risk factors to be identified. 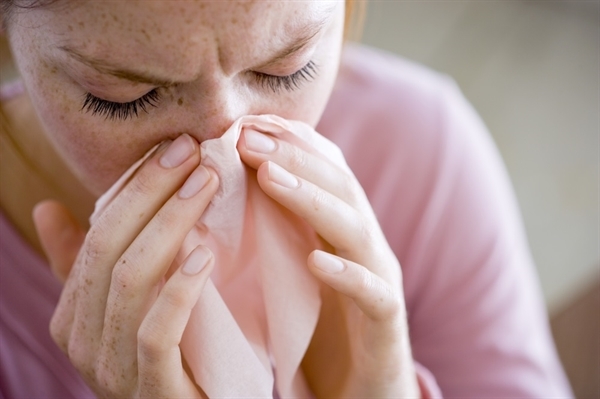 Diagnostic tests, including a skin test and a blood test, should be used to rule out allergic causes.13 The skin test assesses for a reaction to common airborne allergens, such as pollen, mold, and dander, whereas the blood test measures the immune system’s response to such allergens by assessing IgE levels. If these tests are negative, a diagnosis of NAR is made. However, a positive finding on these tests does not necessarily rule out NAR, as it can coexist with AR.13 If treatments in patients with AR are unsuccessful or suboptimal, coexisting NAR should be considered. What pharmacologic agents are available to treat NAR? Can anything else be done to manage NAR? NAR is a common and often overlooked disorder because of its many nonspecific symptoms, lack of diagnostic testing, and frequent coexistence with AR. Proper diagnosis of NAR requires a high level of suspicion. A careful review of the patient’s history is essential, and allergen testing should be conducted to rule out AR; however, positivity for AR does not exclude the presence of NAR. 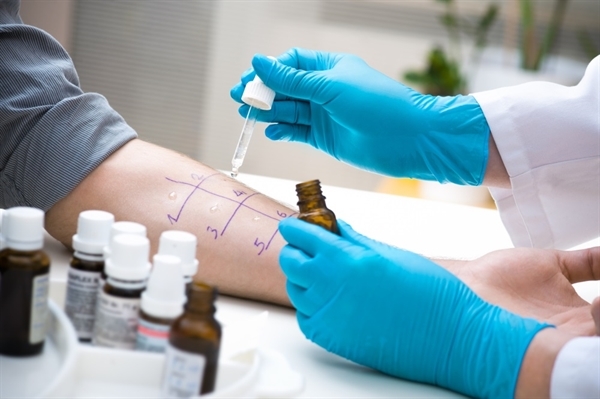 Once diagnosed, use of topical intranasal glucocorticoids and topical antihistamines has been shown to provide the greatest relief of symptoms across the NAR spectrum, but treatment should always be tailored to the patient’s specific symptoms. In many cases, multifaceted interventions that use pharmacologic and adjunct strategies, such as trigger avoidance, are necessary for optimal relief. Rhinitis is an irritation or inflammation of the nasal mucous membranes. It can be caused by infectious pathogens, irritants, or allergens. Allergic rhinitis (AR), which is triggered by allergens such as dust, mold, and pollen, is the most common form, affecting 10% to 30% of persons worldwide.1 In the United States, this translates to approximately 84 million people.2 Nonallergic rhinitis (NAR) is a form of rhinitis that does not involve the immune system and often has an unknown etiology, though many triggers have been identified. The prevalence of NAR remains unclear, but it appears to be common, with some estimates suggesting 19 million persons in the United States are affected.2 However, this number likely underestimates its prevalence because NAR is difficult to diagnose in the setting of allergen-specific immunoglobulin E (IgE) positivity and the condition has been found to coexist with AR in a substantial number of patients.2,3 Based on such findings, it has been suggested that 50% to 80% of patients with rhinitis may have NAR, whether alone or, more commonly, as a mixed disease with some form of AR.2,4 To ensure a proper diagnosis, which is essential for optimal relief of symptoms and avoidance of unnecessary medications and treatments, clinicians must maintain a high degree of suspicion for NAR and should not rule out its presence based on an AR diagnosis alone. American Academy of Allergy Asthma & Immunology. Allergy statistic. www.aaaai.org/about-aaaai/newsroom/allergy-statistics. Accessed February 14, 2017. Settipane RA, Charnock DR. Epidemiology of rhinitis: allergic and nonallergic. Clin Allergy Immunol. 2007;19:23-34. europepmc.org/abstract/med/17153005. Accessed February 15, 2017. Lieberman PL. Chronic nonallergic rhinitis. UptoDate. cursoenarm.net/UPTODATE/contents/mobipreview.htm?2/9/2193?source=see_link. Accessed February 15, 2017. Groves M. Non-allergic perennial rhinitis: a family of disorders. www.bcm.edu/departments/otolaryngology/education/grand-rounds/non-allergic-perennial-rhinitis-disorders-fam. Accessed February 14, 2017. Settipane RA. Epidemiology of vasomotor rhinitis. World Allergy Organ J. 2009;2:115-118. Nozad CH, Michael LM, Betty Lew D, Michael CF. 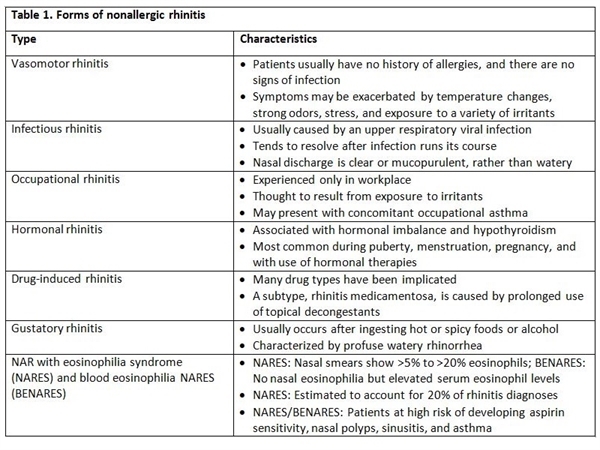 Non-allergic rhinitis: a case report and review. Clin Mol Allergy. 2010;8:1. Tran NP, Vickery J, Blaiss MS. Management of rhinitis: allergic and non-allergic. Allergy Asthma Immunol Res. 2011;3:148-156. Ramakrishnan VR, Cooper S. Pharmacotherapy for nonallergic rhinitis. emedicine.medscape.com/article/874171-overview. Accessed February 14, 2017. American Academy of Allergy Asthma & Immunology. Nonallergic rhinitis (vasomotor rhinitis). www.aaaai.org/conditions-and-treatments/conditions-dictionary/nonallergic-rhinitis-vasomotor. Accessed February 14, 2017. Mayo Clinic. Nonallergic rhinitis. www.mayoclinic.org/diseases-conditions/nonallergic-rhinitis/home/ovc-20179167. Accessed February 15, 2017. Lieberman PL. Patient education: Nonallergic rhinitis (runny or stuffy nose) (Beyond the Basics). www.uptodate.com/contents/nonallergic-rhinitis-runny-or-stuffy-nose-beyond-the-basics. Accessed February 15, 2017. Kalpaklioğlu AF, Kavut AB, Ekici M. Allergic and nonallergic rhinitis: the threat for obstructive sleep apnea. Ann Allergy Asthma Immunol. 2009;103:20-25. Scarupa MD, Kaliner MA. Nonallergic rhinitis, with a focus on vasomotor rhinitis: clinical importance, differential diagnosis, and effective treatment recommendations. World Allergy Organ J. 2009;2:20-25.